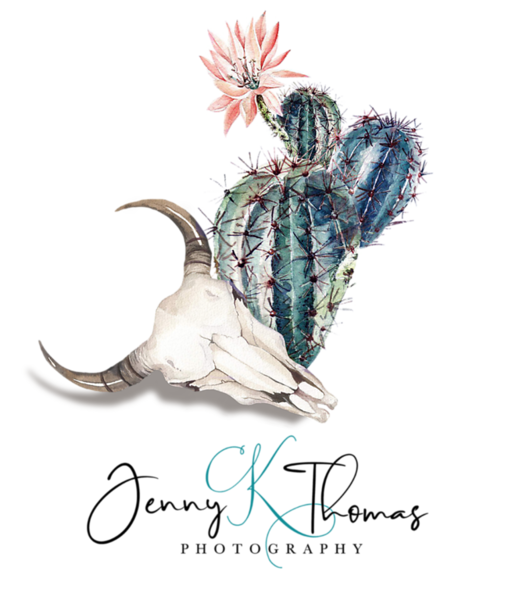 A collection of images that feature wildlife and other animals of New Mexico, Colorado, the Southwest, and more. 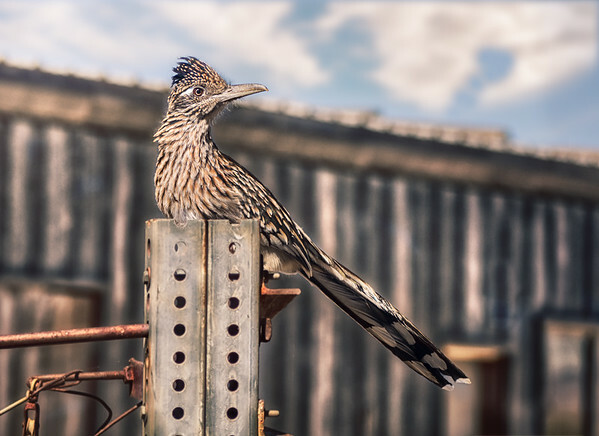 A roadrunner poses upon a gate post in Lordsburg, New Mexico. 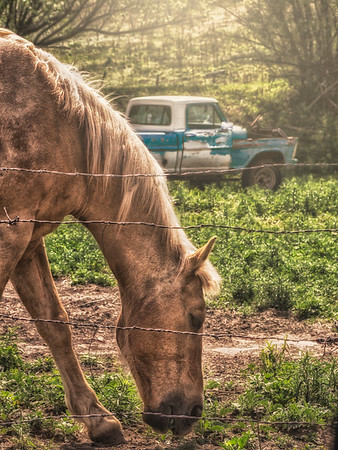 A horse enjoys leafy greens near Mora, New Mexico. 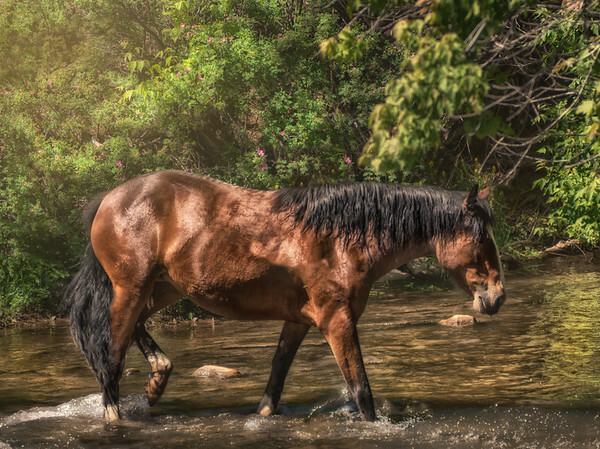 A free-roaming horse takes a refreshing dip in a tributary of the Pecos River called Cow River, which was lined with yellow and light magenta flowers at North San Ysidro Village in New Mexico. A horse, a barn, and much needed desert rain outside Cotton City, New Mexico. 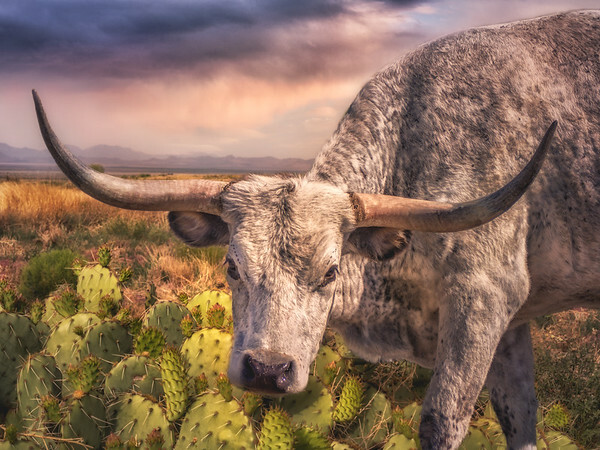 A longhorn in pauses in front of a patch of prickly pear cacti in HIdalgo County, New Mexico. 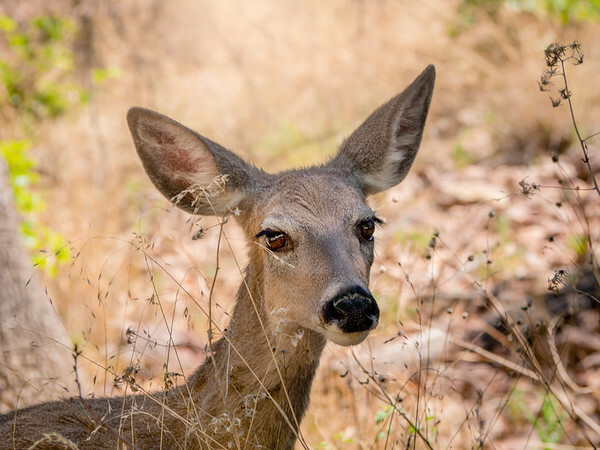 A deer posing for the camera in Coronado National Forest near Portal, Arizona. 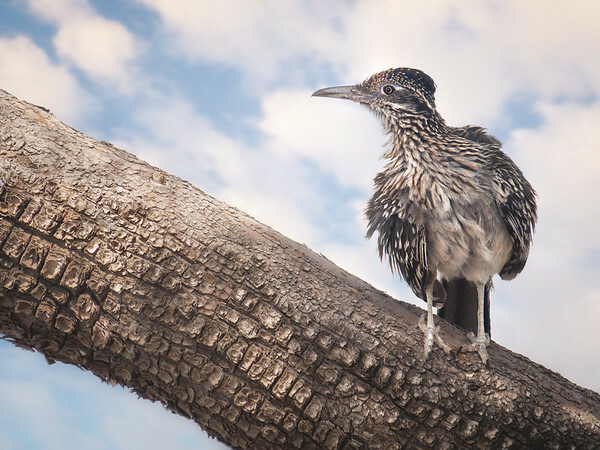 This roadrunner, spotted in a tree in Lordsburg, New Mexico, was the perfect model. 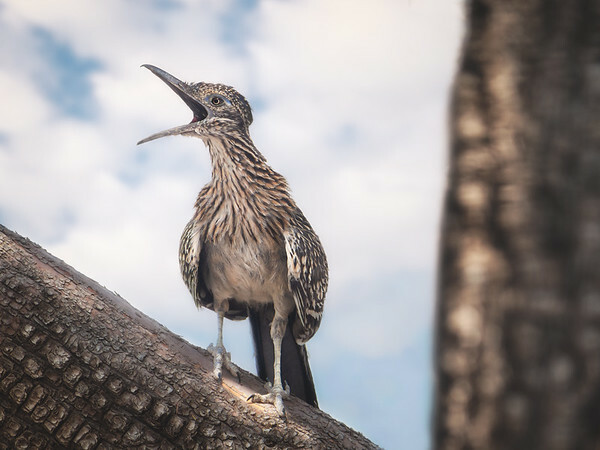 A Greater Roadrunner is spotted ruffling his feathers on a tree branch in Lordsbburg, New Mexico. 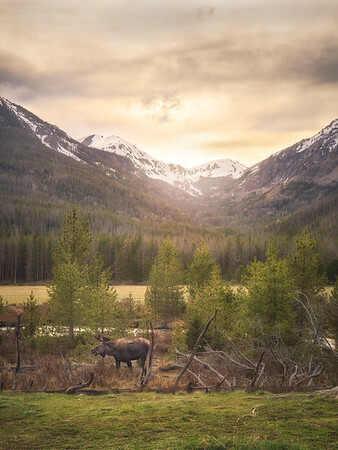 A moose wanders near the river during sunset in Rocky Mountain National Park near Grand Lake, Colorado. 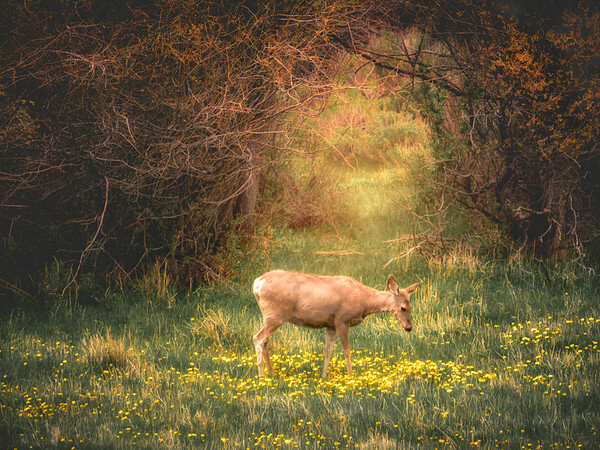 A mule deer grazes in grasses dotted with yellow flowers in front of a passageway created by remaining winter vegetation near Hot Sulfur Springs, Colorado. An excited Greater Roadrunner appears in Lordsburg, New Mexico. 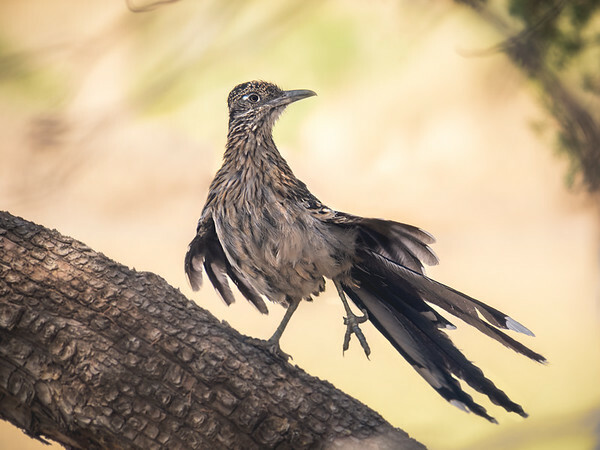 In certain lighting conditions, the peacock-like colors of the Greater Roadrunner appear. Note the shades of blue and green of the feathers and the purplish-blue highlights of the head crest. Of course, the reddish-orange streak behind the eye is a well-known feature. 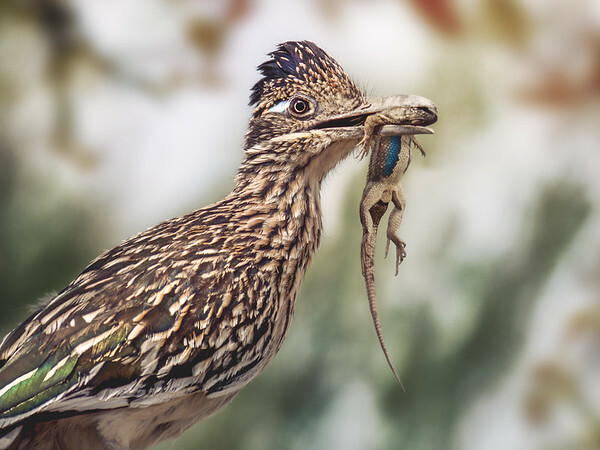 The lizard was likely an offering from this male roadrunner to a mate. Taken in Lordsburg, New Mexico. 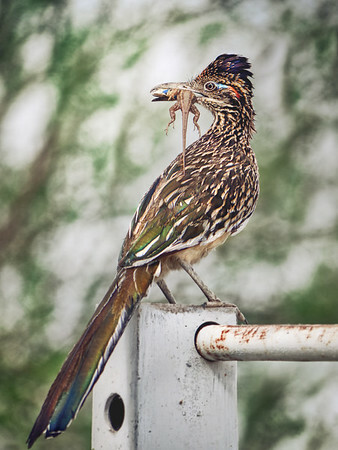 During mating season, a male Greater Roadrunner carries this western fence lizard–a likely present for a mate–in Lordsburg, New Mexico. 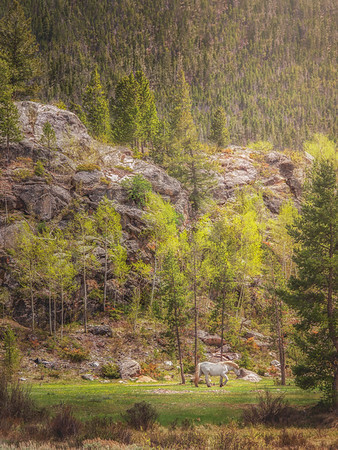 That magical moment when a majestic white horse strolls across a flower-dotted meadow, against a craggy backdrop in the Rocky Mountains. Taken near Grand Lake, Colorado, in Rocky Mountain National Park. 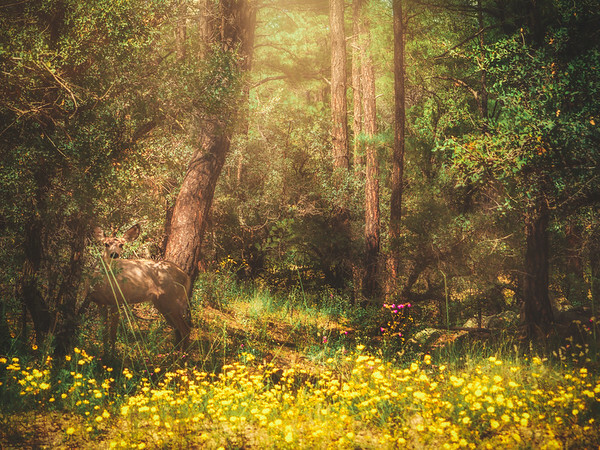 A deer peeks cautiously from the Gila National Forest outside Silver City, New Mexico. 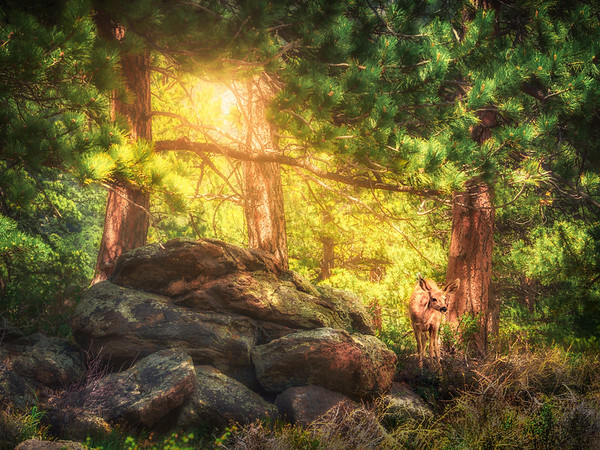 A mue deer peers around a pile of boulders in Rocky Mountain National Park in Colorado. 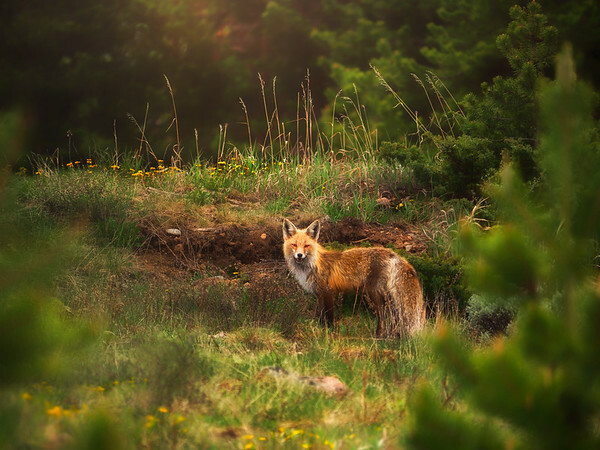 A beautiful red fox pauses beneath a flower-dotted ridge in Grand Lake Colorado. 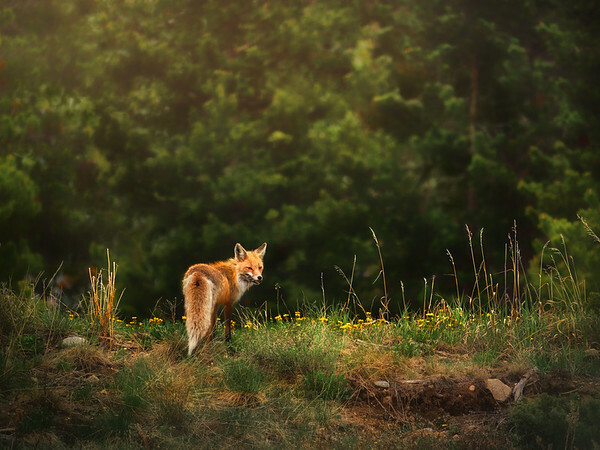 A red fox, with a small bird in mouth, heads toward the trees in Grand Lake, Colorado. 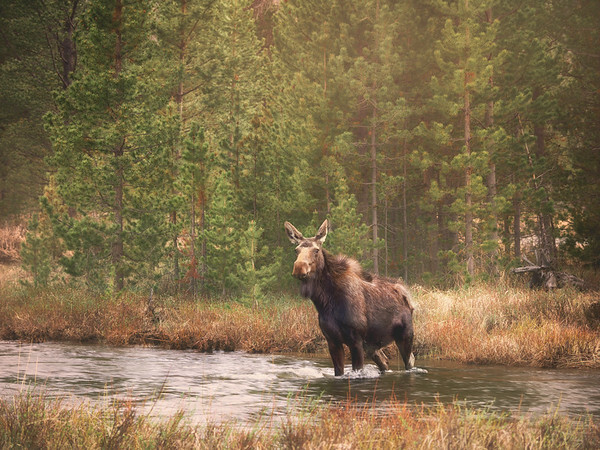 A moose crosses the a river in Rocky Mountain National Park in Colorado. 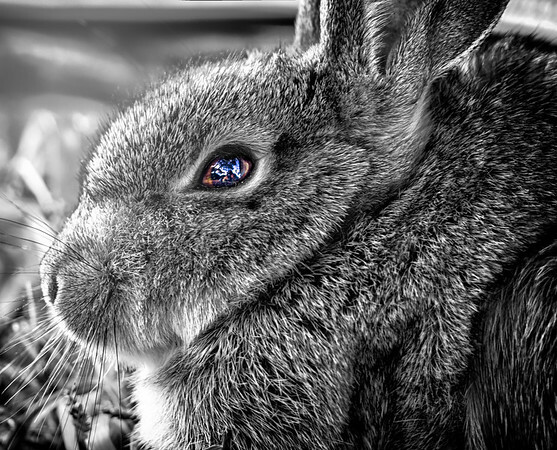 Because I was able to come within inches of this young cottontail, you can see my reflection in it's eye. Taken in Lordsburg, New Mexico. 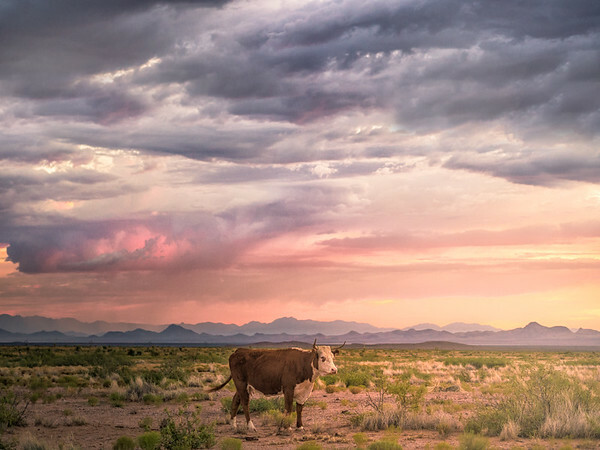 A cow wanders through the desert during sunrise near Lordsburg, New Mexico. 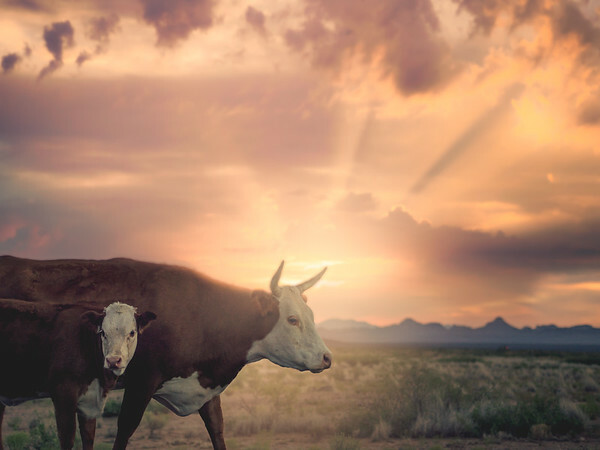 A family of cattle meander in front of the Peloncillo Mountains during sunset near Lordsburg, New Mexico. 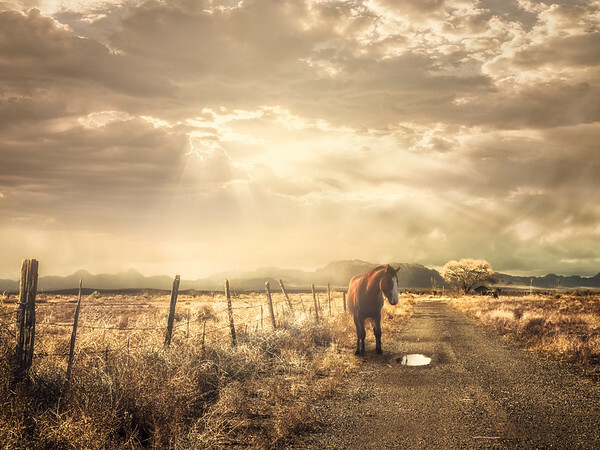 A horse notices its reflection during a winter rain in Lordsburg, New Mexico. 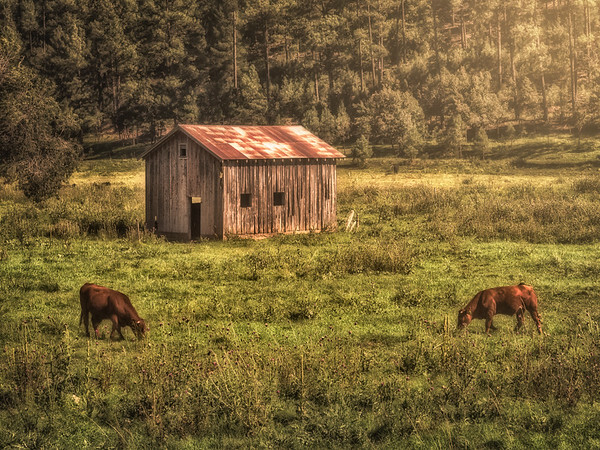 Cattle graze in this country scene between Cloudcroft and Ruidoso, New Mexico.